Jamaica offers so many unique experiences to the discerning traveler that a single trip to the Island does not give you enough time to experience all that is available to you. 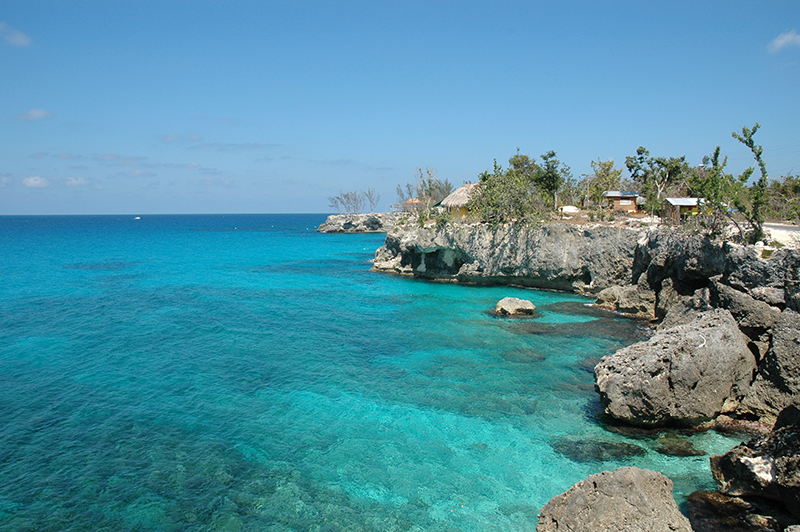 One of the newer attractions that you should try not to miss on your next Jamaican trip is the Calico Jack Private Island in Negril. Negril is one of the most naturally beautiful parts of the island, and seven-mile beach in Negril is one of the best beaches in the Caribbean. Negril is also home to the world-renowned Rick’s Café where one can go to grab their favorite cocktail while relaxing to some soothing Caribbean music and then take a plunge of up to 40 feet from the nearby cliff into the endearing blue waters of the Caribbean Sea. The Calico Jack Pirate Island adds another dimension to the Negril experience which makes a trip to this laid back and casual resort town even more special. Calico Jack Pirate Island is a rustic bar perched on a private island located just fifteen minutes north of Negril’s Seven Mile Beach. The only way to get to this hidden treasure is to jump on a boat for a fifteen-minute ride. The Calico Jack Pirate Island is still a relatively unknown attraction and has the aura of an exclusive hideaway experience. The Private Island rekindles the Pirate experience, you will meet Jack Rackham (Calico Jack) and his two female crew members Mary Read and Anne Bony all dressed up in their pirate garb which adds some flair to the experience and sets the attraction apart from what you get at a typical sports bar. There is also an endless flow of your favorite cocktails from the bar and some of the best local cuisine – ranging from seafood to jerked chicken and pork; you will enjoy dining while enjoying stunning views of the Negril area and the crystal clear Caribbean Sea. Calico Jack Pirate Island is surrounded by a protected reef system and also the Half Moon Marine Sanctuary which makes it a perfect spot for snorkeling and scuba diving. You should, therefore, take the opportunity to explore the unspoiled marine environment on this island gem by diving and snorkeling to your heart’s content! There will be minimal numbers of people snorkeling or diving at any particular time, so you will be able to enjoy the experience without feeling rushed. There are only a few places in Jamaica that give you such privacy and freedom when diving or snorkeling. Finally, Calico Jack Pirate Island offers a unique experience in every sense of the word. It is the only bar in Negril that requires you to take a boat to get there, it is the only pirate-themed bar in Negril, and it is one of the most romantic attractions in Jamaica. A visit to the nostalgic Calico Jack Pirate Island will be a memory that will be etched in your mind for a lifetime, and it might be your first of many trips! Travel Around Jamaica Tours is dedicated to providing fun and affordable Jamaica adventure and sightseeing tours to all tourist destinations in Jamaica, including popular tourist destinations, such as Ocho Rios, Montego Bay, Negril, and Falmouth. We guarantee 1st class, round-trip private Montego Bay airport transfers to all hotels and resorts in Jamaica, starting at $54! To learn more, visit travelaroundjamaica.com. Negril Jamaica, the “Capital of Casual” has come a long way from being just a sleepy small Jamaican fishing village prior to being discovered by American Hippies in the 1960’s. In fact, today Negril is one of the most popular travel destinations in Jamaica besides Montego Bay, and offers a great selection of luxury hotels, resorts, clubs, events, and tours to choose from. 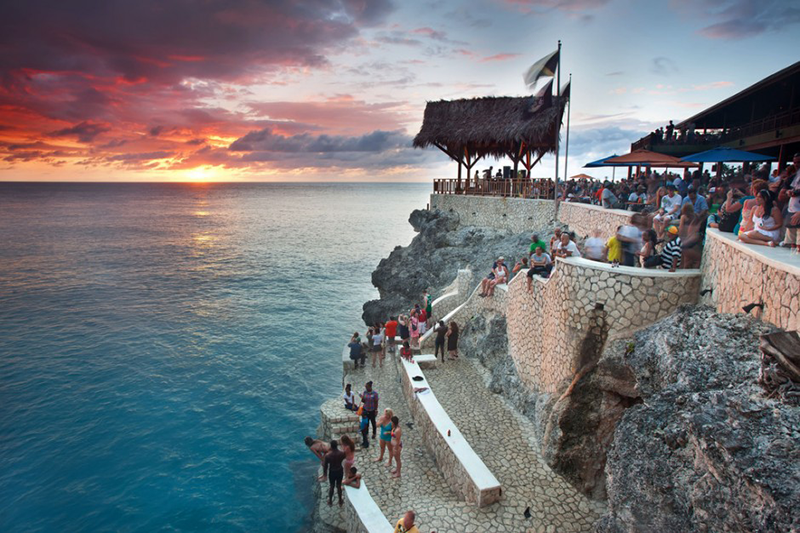 Rick’s Café is perfect for people of all ages and especially adventurous college students who want to go cliff diving off the 40-foot cliffs, or enjoy local Jamaican cuisine, drinks, and live music at one of the top rated beach bars in the world! 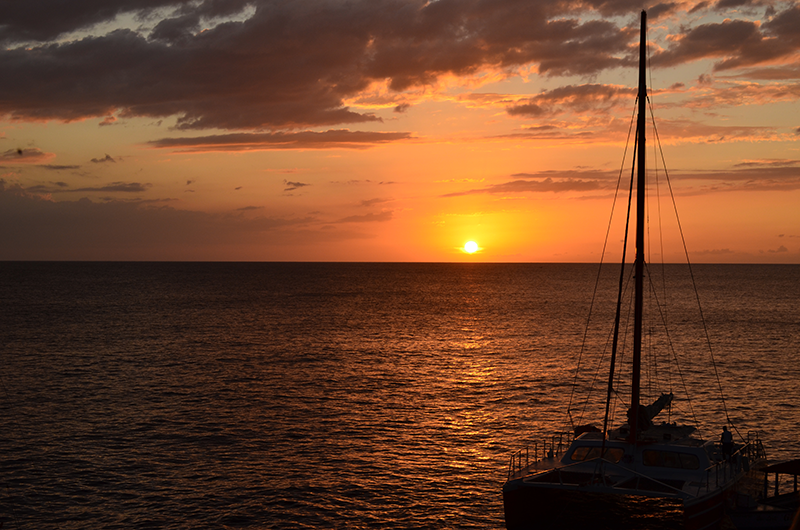 Visit our Negril Sunset Day Tour page to learn more. Seven Mile Beach in Negril, Jamaica, offers 7 miles of (clothing optional) sandy white beachfront where you can participate in a great variety of fun activities, such as barefoot bar hoping (since there are no open container laws for drinking alcohol in public places in Negril), snorkeling, parasailing, swimming, or scuba diving. There are many great open air nightclubs in Negril, such as The Jungle Night Club, which features 2 dancefloors, 7 bars; an outdoor Sports Bar patio with seating for 100, and more! The Jungle is open every Thursday and Saturday from 10:00 P.M. until 4:00 A.M. In addition, a Free Jungle Shuttle Bus is available for transportation back to your hotel, resort, or guesthouse. Other popular night clubs in Negril, include: Risky Business, which is located on Seven Mile Beach and features live music nightly and a great restaurant, bar, and lounge. In addition, there is Jamaica Tamboo, which is perfect for anyone looking to party during the day, since it has an open bar from 11:00 A.M. to 4:00 P.M. and lots of contests and dancing. In addition, Jamaica Tamboo hosts the Saturday night VIP Party Beach Bash, which is one of the largest parties of the week in Negril! Last but not least, Margaritaville Negril turns into one of Jamaica’s hottest nightclubs in the evening with up to 12 bars and great theme nights, such as Mardi Gras Wednesday’s and Friday’s Foam Hook Up Party, that features the only foam pit in Jamaica! If you’re looking for a great adventure tour in Negril there are many excellent scuba diving and snorkeling tour operators in Negril. 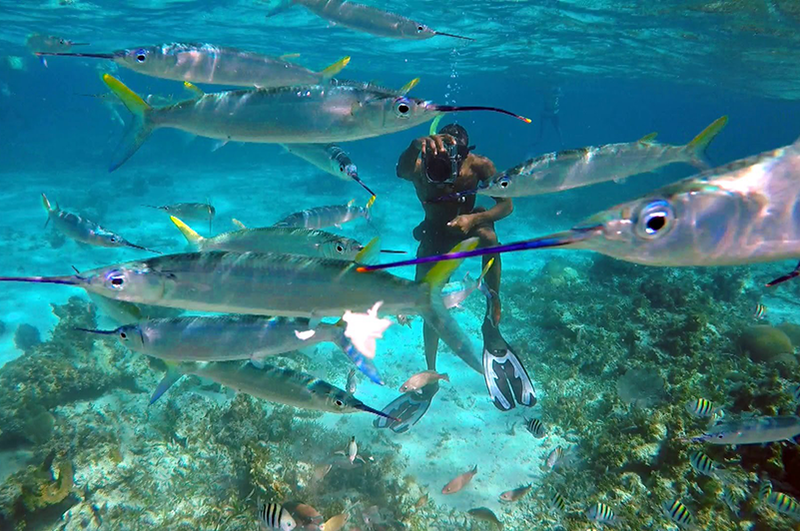 Contact us to get suggestions for the top snorkeling and scuba diving tours in Negril. In addition, there are also many great glass bottom boat tour operators in Negril, which often also offer snorkeling to explore the stunning underwater coral reefs and aquatic species of the Caribbean Ocean. Contact us to get suggestions for the top glass bottom boat tour operators in Negril. Travel Around Jamaica Tours specialize in providing private Jamaica Airport Transfers from Sangster International Airport in Montego Bay to all hotels, villas, and resorts in Jamaica! In addition, we also offer a great variety of private Jamaica sightseeing and adventure tours from Montego Bay, Negril, Ocho Rios, and Falmouth. Check out our great selection of Negril Tours on our website. If you don’t see any tours that interest you we also offer custom Negril sightseeing and adventure tours, which include scuba diving, snorkeling, and essentially anything else you want do while you’re in Negril! To contact us about our custom Negril tours and excursions, call 1 (876) 287-2180 or email us at info@travelaroundjamaica.com.